Host your next event or off-site. Hone your skills in 4 metro locations. High ceilings, bright walls and rock and roll decor create a memorable environment for an event or offsite. Use the two foot high stage for theater presentations or speakers, or set up for an event or meeting. 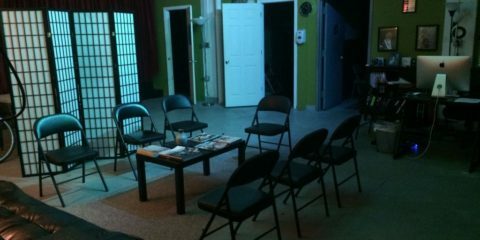 Room can be set up for 20-35 seated spectators for theater (chairs included), or cleared as a fun event space. 29'x21' main space plus 11'x21' curtained stage Maximum capacity: 40. Acoustics are excellent and speaker amplification is not needed--however, mics and a small PA are available. 315 E 91st Street. 6 minute walk from the Q train or a 10 minute walk from the 4, 5 and 6 trains. 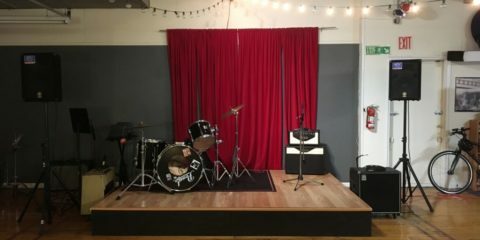 Rates: Theater Rehearsals, Workshops, etc. 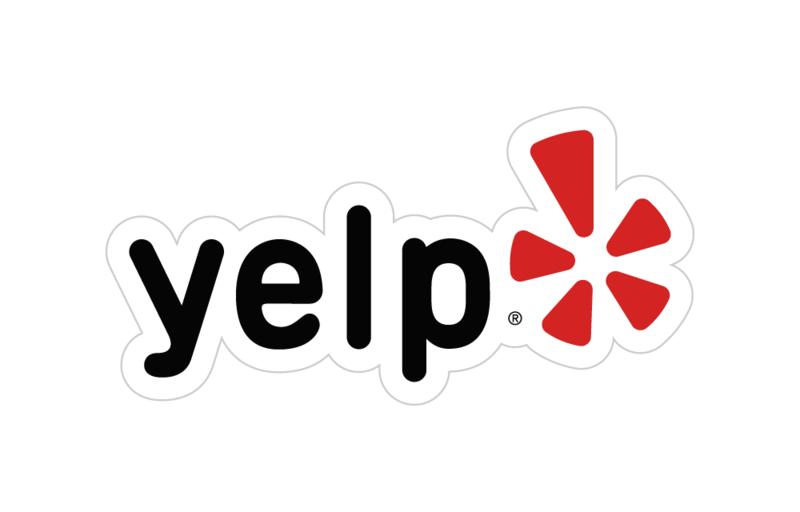 ($50/hour), Birthday Parties ($100/hour), Theater Performances / Special Events ($150/hour). Package rates available for multiple days. ***Note: the entire school including event room, stage, and five classrooms is available over the summer and during school breaks. Contact nycgseast@gmail.com for more info. 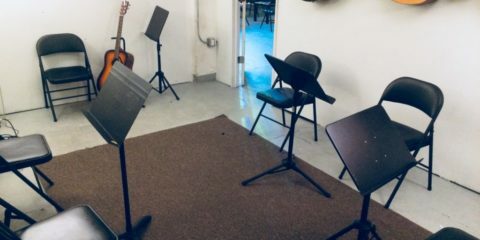 Our beautiful loft space near Barclays Center is available when Brooklyn Guitar School is not in operation. 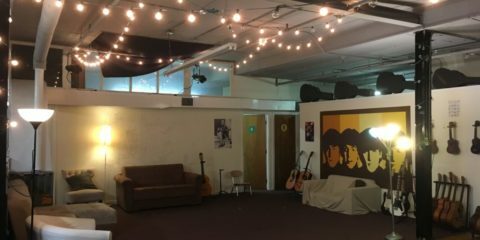 The ceilings are super high, and the spacious rooms, skylight, bright walls and rock and roll decor create a memorable environment for theater or musical presentations, readings or parties. 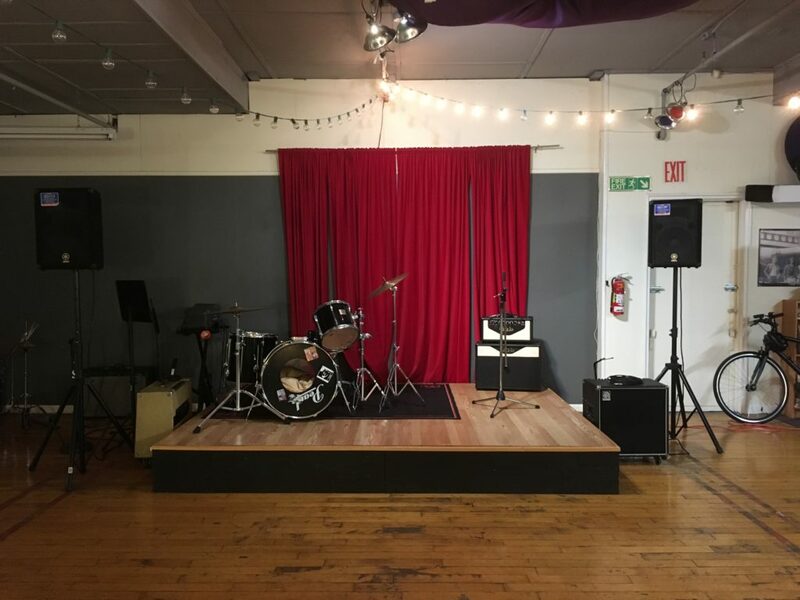 Room can be set up for up to 40-50 seated spectators for theater or music (chairs included), or cleared as a fun event space. 40'x24' main space including 8'x9 stage. Maximum capacity: 60. Small prep room with sink, table and microwave. Extra utility rooms available. 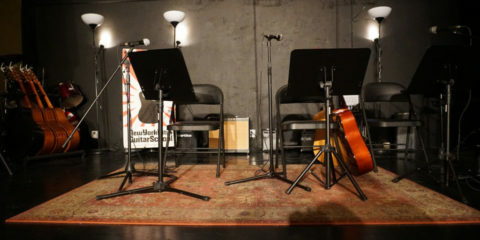 Acoustics are excellent and speaker amplification is not needed--however, mics and a small PA are included if desired. Note: access by stairs only. 81 4th Avenue. 5 minute walk from Atlantic Ave / Barclays Center train stop and the 2, 3, 4, 5, B, D, N, R, Q and LIRR trains. ***Note: the entire school including event room, stage, and eight classrooms is available over the summer and during school breaks. Contact info@brooklynguitarschool.com for more info. 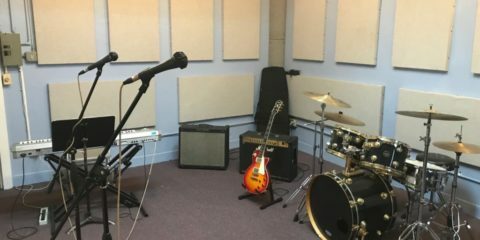 Lock in a regular rehearsal time for your band with a monthly room share in the NYC Guitar School Rock Rooms. 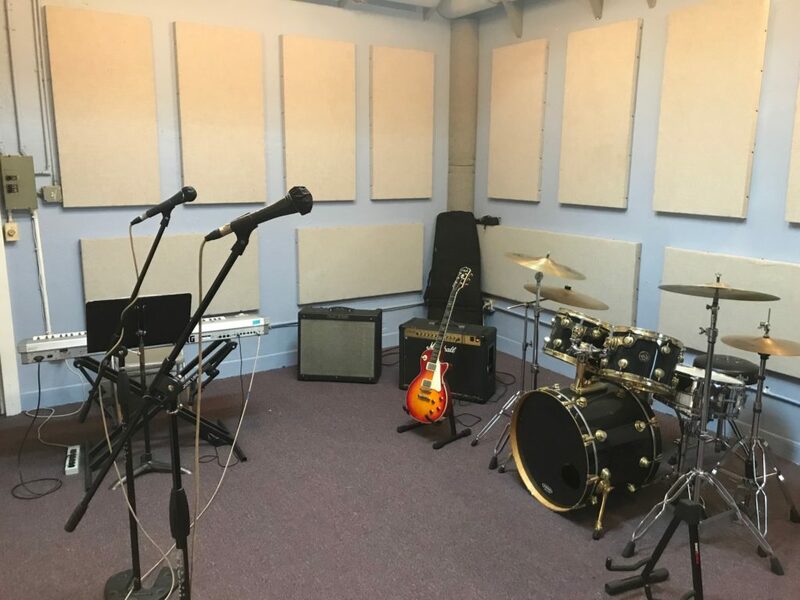 The NYCGS Rock Rooms are located in the iconic Music Building. 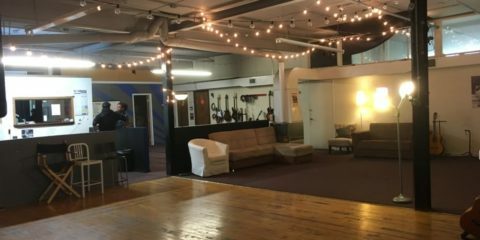 Artists including Madonna, Metallica, The Strokes, Parliament, David Byrne, Interpol, Patti Smith, Joey Ramone, Billy Idol, The New York Dolls, Lou Reed, and more have rehearsed and recorded in the building. 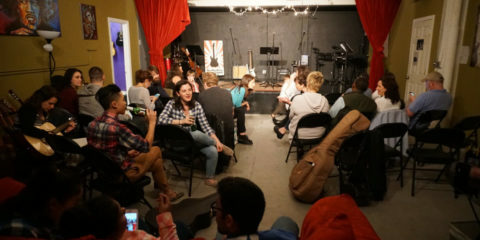 We love being part of this community of working musicians. 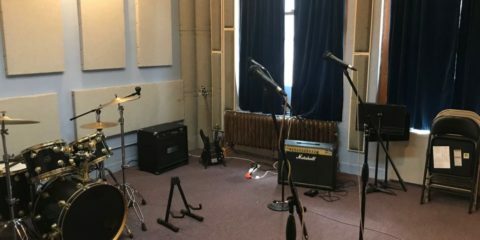 Fully equipped rehearsal rooms include drum kit, amps, PA and mics. 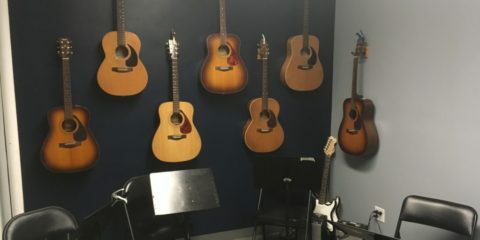 3-hour/week lockouts are $375/month for non-students, $250/month for NYC Guitar School students. 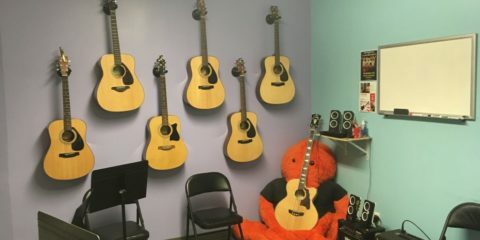 2-hour/week lockouts are $300/month for non-students, $200/month for NYC Guitar School students. 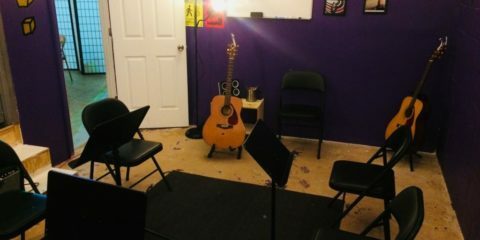 Monthly rentals only / References required for non-NYC Guitar School students. To check availability, email us at rockband@nycguitarschool.com. 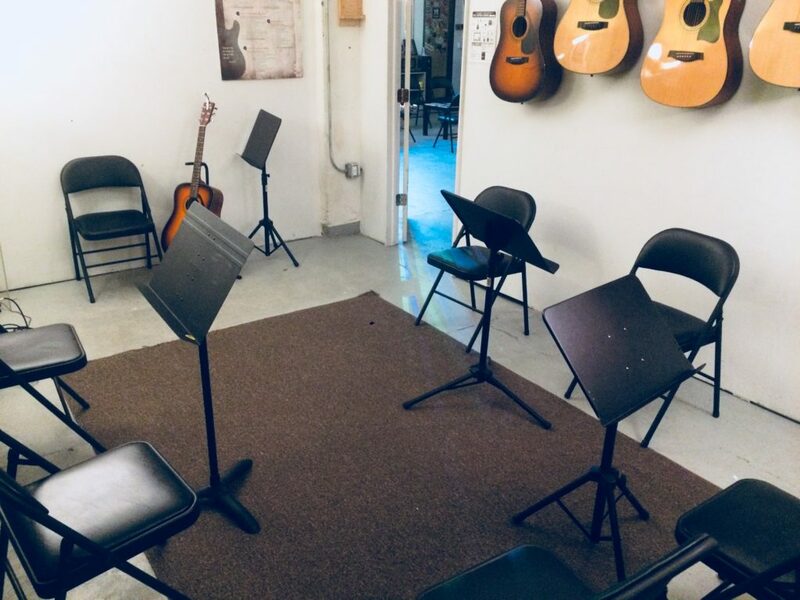 Use a beautiful NYC Guitar School classroom for your private or semi-private acoustic practice session. Midtown, Brooklyn, Queens or The Upper East Side. Note: no drums, horns or amplification allowed. $20/hour non-student, $15/hour NYCGS student.